So that's a female rogue, female dwarf, an elf of indeterminate gender, and a female hunter. Well, anyway. The first floor is a reasonable-simple, though slightly-tedious puzzle involving windows, natural light and crystals, and I tend to just run straight through it nowadays. I forgot to take pictures. You’re not missing much. You can, technically, solve this puzzle before even activating it, if you’ve memorised where the beams of light fall after opening the windows, but I’m always slightly off with at least one crystal. I don’t think you get anything from doing that, anyway, aside from possible bragging rights. The second floor is likewise mostly boring – flipping four switches to activate a tiny bridge. Again, I forgot to take pictures because this puzzle is dull and I try to get past it as quickly as possible. It also possesses the earliest save point I’ve seen in any level, probably because this floor will do something very nasty to you if you don’t watch out. More on that later. So, there are two interesting things on this level. First is the area’s obligatory multiplayer-bonus. This one, unlike the one in the Mines, requires good timing and little else. I also swear it’s possible to complete alone, with a Rogue, and a lot of attempts. It’s ‘solved’ by deactivating all four purple-sparkle generators by standing on them; they reactivate after a short period of time, and walking normally you’re going to have at most two deactivated at once. As I said, somehow I managed to complete this at one point, and I’m reasonably certain it was using a Rogue character, thanks to their dash. Your milage may vary. If you fell down here, you’d expect to suffer approximately 8 points of damage, right? Well, you’re practically guaranteed to fall off the bridge in this room. 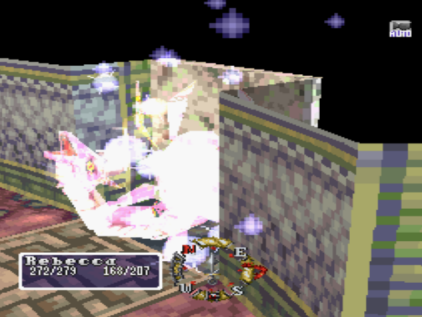 The Old Palace is probably the most intentionally trap-filled area in the game, featuring quite a few ‘kill all enemies’ rooms in addition to pendulum traps, spiked ceilings, and fire-breathing wall fixtures, but this particular trap has to be one of the more irritating ones lying around. First, the bridge starts collapsing after you, once you’re more than a few ’tiles’ in; if you continue walking, you won’t be caught out by this, and it happens slowly enough that you can keep ahead of it. As you may have noticed, there’s a spiked gate at the door you entered by, and there’s a corresponding one at the far exit. So there’s an enemy to kill, in the room. That enemy is the real problem of the room; it’s a floating armour, it’s resistant to most attacks and spells you can throw at it – I was only doing 50~ damage with a third-level spell – and it has several times more HP than you’re expecting on enemies at this point in the game. 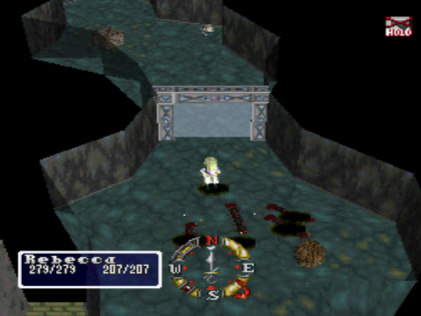 Worse, all its attacks are knock-back attacks; if it catches you before you’re between it and a wall or the door, it can very easily toss you off the bridge. It probably does nasty damage at the time you first reach this point, to boot. So the first few times you come here, you’ll probably be falling off the bridge. Rather than a negligable amount of damage, doing so dumps you two floors below ground; you have to work your way back up to even be able to exit the place. Successfully getting out of the room by the door lets you skip all of that. Of course, I’m dropping down anyway just to show you the area. Note that I’m heading in the ‘wrong’ direction here; leaving the floor and then returning causes the bridge to reappear, and it collapses from whatever side you entered by, just to make things trickier for you. Welcome to the second underlevel. I always thought the area you fell in was vaguely reminiscent of Dullahan’s boss arena; it’s a roughly-circular area of moderate size with exits at the cardinal directions, and chains hanging around. Much brighter, though, and of course it lacks the headless boss. The floor can pretty much be split into four separate areas; north has a suspicious-looking open area up there, so let’s start with north. What looks like the direct entrance to the area is on a raised area that we can’t reach, but there still seems to be two side entrances, so let’s try those. Another general theme of this area would be ‘taunting the player with stuff they can’t reach yet’. The guy in black posing with his minions down there is the boss of the first half of the Old Palace, but we can’t get to him yet. Well, technically, we can, as I went ahead a little and opened the route to him before deciding to go through this bit anyway, but there are more interesting things to see and do down here that you miss if you ace the bridge the first time. Going around the other side is the same; another magical green forcefield-window thingy blocks your way. Back to the centre, that leaves us with three options; let’s go… west. There’s another suspiciously round-ish area there, and since this isn’t the Mines, there’s liable to be something interesting there. Most of the ‘built’ areas have something interesting in each room, whilst ‘natural’ areas like the Abandoned Mines or the Wood of Ruins tend to have useless places and dead ends. Nice touch; why build something if you’re never going to do anything with it? This one’s particularly interesting as it gives us backstory. Few areas in the game give us history lessons; the Ancient Ruins are one of the areas, as is the Old Palace. There’s a third area, but I probably won’t be seeing it for a while, and then there’s the Jester guy in the Roadside Inn, who sometimes mentions interesting things. The ‘correct’ order to read these things is from north to south; it doesn’t solve any puzzles, but it’s nice to get the story straight. Foresia, a land plagued by demons. Saturated with magic like no other land. For those of us who control the power of sorcery it is the true paradise. We, who are called sorcerers, could create flames and wind from nothingness through the art of magic. Arcane artefacts created by the Twelve sages, the Sagestones strengthen the sorcerers and help them to master the art of magic. With such power we could perform miracles, we would be like gods. The Twelve Sages established a great kingdom with abundant magic through the use of the Sagestones. But in mortal hands this power became too much, and this overabundance of power became a danger to us. And they begat demons of terrible and maddening power. It may only be a matter of time before the demons destroy us. Well, straight-ish. I’m guessing that this was written during or shortly after the fall of the ancient civilisation mentioned in the introduction sequence, as whoever wrote it still remembered the Twelve Sages and their relationship with the Sagestone…s. Plural. It’s also biased towards what the Sagestone meant for Sorcerers. I’m feeling right at home, here. Pity there’s just the one left, huh? And it isn’t really doing anything for the rate at which I learn magic, though that could be because it’s incomplete, and because I’ve already learned all the spells I’m going to learn naturally. That’s all there is here, so now… east, I think. …except we can’t go there as the door’s sealed right now. Pity. We can’t get there from the south, either, because it’s another raised area you can’t jump to. We’ll be back here later. South takes you into one of the more annoying kill-all-enemies rooms, depending on where you entered from. All of the enemies are the flying goblinoids-that-aren’t-gargoyles-because-those-are-made-of-rock. They move quickly, are annoying to hit in melee, and troublesome to cast spells at as they tend to throw the Fairy Sleep spell at you frequently. Falling off here, if you came around from the eastern section of the level, means a fair bit of backtracking. Taking the teleport beyond brings you to the first underlevel, an area more tedious than anything else. The point of this area is to open two doors that will allow you to get back to the first level of the area; the teleporter on the northern side of that level leads here, but the door’s locked until it’s opened from this side. It’s full of kill-all-enemies rooms, right from the beginning, and even has a short timed section that happens to be the main source of tediousness if you’re just a bit too slow. There are, of course, yet more traps here. The good thing about this area is that a fair portion of the enemies can drop Fate Coins. The Old Palace in general is a good spot for hunting those, especially later on when you’ve opened up the second part, but the Blue Lizardmen here seem to be the most generous of all the early enemies. If you forgot to pick up the keys near the entrance, you have a bit of backtracking to do. The two doors you’ll want to open – to progress or to go back to the Inn after this ordeal – are coloured blue or red. The southern door is blue, and the northern red. The locked doors here contain a symbol on the wall matching the doors to the teleporters, and a crystal, which is somehow keeping both doors shut. It’s still not much of a puzzle, but this is why I try to avoid falling off the bridge in the first place, especially if I’m playing a melee class; you have to make it around the circular-ish area to the corresponding room on the other side, and there’s always one kill-all-enemies room in your way, populated with four slimes and a couple of other enemies. Slimes are notoriously-resistant to physical damage, so if you’re not playing a Sorcerer or Elf, you may want to go clear out both rooms beforehand. Successfully activating the second crystal whilst the first is still activated opens both doors. I hate these floors; there’s no loot before you beat the boss, unless you’re a Rogue – there’s a locked door on one of them and there may be treasure behind that – and it seems like they’re just there to waste time, with the exception of the history monoliths. Bringing us happily back to immediately after the bridge room. Whoo. Okay. South teleport takes you onwards – back to the second floor – whilst the north teleport takes you back to the first floor. Perhaps I won’t forget it, this time. Right. Third level. Which I already completed, before deciding to go down to the underlevels. This floor’s puzzle involves more light, crystals and running long distances, and I’m just going to skip giving you the solution, as I’m lazy, there’s little to see, and this isn’t a proper walkthrough. Just don’t forget to collapse the floor in the room east from the red lizardman room, as backtracking is a headache here. Getting through that floor brings you back to the… Second Underlevel. This time you’re on the raised section that leads to the proper entrance to the boss area, and there’s a little pillar-thing you can push down so you can get back here after jumping down to find the save point. Never forget to do that, hm? It’s a crushing feeling when you forget. So, the boss. Meet the Dark Elf; here, he’s about to throw a hissy-fit because you avoided all his traps and killed all his ‘friends’ who set out to attack you. Seriously, though, the Dark Elf is one of the more annoying mandatory bosses, as he’s almost as small as you are, and moves relatively quickly, making him difficult to target or pin-down by any character; he also cheats, like the goblinoid magic-users, and has spells from both the Fairy and Sorcerer lists. Apparently you can talk him out of fighting if you’re an Elf, and already have the Sagestone jewel from the encounter, but I suppose he might have loot. This is really annoying, as you don’t get any chance to dodge it, and at the time you first encounter the Dark Elf, you have little chance of resisting it. Slow, as you can expect, slows you down for a period of time; as much of this battle involves dodging the Dark Elf’s high-level spells, getting hit by this can be painful. I didn’t see him use Slow in this fight, but memory tells me he can use it. It also makes sense that he’d have it, as he has the rest of the first-level Fairy spells available to him. Fairly annoying, but this one only means a single guaranteed hit, unless you’re somehow lucky enough not to be hit for the duration of the status. Sleep as a status lasts a very long time, so don’t count on it, but the projectile the spell releases moves very slowly, and is easy to outrun. Makes him move faster; his physical attacks suddenly become a lot more difficult to avoid with this active, but it thankfully doesn’t affect his casting speed. Much like the Sorcerer version, this one is unpredictable and rarely fires in a straight line. Just keep moving on the other side of the arena from the Dark Elf and pray it doesn’t hit you. This is actually one of the nicer spells the Dark Elf can use; it doesn’t have a chance of hitting you multiple times, and it doesn’t cause any bad statuses if it does hit. Same as the Sorcerer spell. Not too tricky to dodge, but it will hit multiple times if you hang around in the affected area. I swear this one has a slightly larger range than a player’s Blizzard spells do, but otherwise it’s exactly the same as the Sorcerer spell. Like Blaze, this one can hit you multiple times, which will probably kill you the first time you visit. Even if you’re not in the direct path of the spell, watch out, as the blue-tint to the screen whilst the spell is active makes it difficult to spot the Dark Elf. Finally, his normal attacks – he seems to do karate or some other kind of martial art – do dark-element damage. Wearing something with light-element protection is a bad idea; probably the best protection would be Wind, as I stuck around for ages and didn’t see him try to use Poison Cloud. For such a small opponent, it seems like the arena is pretty large, but you can’t forget that he tends to use spells that have a long range, or can hit multiple targets; he also starts with three minions that can throw off a selection of offensive spells themselves, so you may need the space for dodging. All that said, however, he’s a Sorcerer and is gracious enough to not have much in the way of health. Just dodge his spells and keep hitting him, and he’ll retreat fairly quickly. I was also lucky enough to get loot. Not-usable loot, but loot all the same. Well, I’ll be heading back for now. I’ve a fair amount of new loot that needs IDing, and it’s really not difficult to get to the second part. Unlike the Wood of Ruins or the Abandoned Mines, the Old Palace doesn’t require much running around if you already know what you’re doing. You may even be able to skip the whole Dark Elf encounter, but I don’t know whether a certain door will open if you do that. I’ll check next time. Oh, yeah. Now that the Dark Elf has been beaten, we ought to be able to check out that sealed area. There’s a Rogue-only door, two chests that only contained HP and MP potions, some more defeat-everything areas, including a very small room with no less than four floating mages, leading to… a Wand of Runes, that I’m already using, and a room with two chests for a Miracle Powder and a lamp of some description. A magical bow, made for the king of the elves. A first class bow of great workmanship. A heavy battle axe, the favored weapon of barbarians. Longer than a normal sword. For somewhere that’s supposedly good for Sorcerers, this place has a lot of non-Sorcerer loot lying around. One of the chests on the third level is a guaranteed piece of Warior/Dwarf/Elf armour, if memory serves, and a lot of the enemies tend towards dropping Bows or Axes. The Elven Bow probably pales in comparison to weapons you can attain later on, but for the point of the game at which it appears, it’s insanely-powerful; Trueheart and the Composite Bow are two bows you tend to pick up more frequently from the enemies here, and are examples of how strong Hunter weapons tend to be at this point. If you’re a Hunter and are lucky enough to get the Elven Bow from the Dark Elf, you’re set weapon-wise for quite a while. Finally, Fairy Powder. I think I have a new favourite item; I don’t care what it does, that’s just an amusing description when your party may include Fairies. Anti-Circle is one of the highest-level non-Forbidden Fairy spells, and apparently protects the party from magic and bad statuses. Having never used it, I can’t say, but it’s an exceptional drop for the first part of anywhere, given how high-level and costly that spell really is. It shows the Goddess of Luck. I’ve mentioned Fate Coins a couple of times previously; they’re the closest thing the game has to a proper currency, as one of the NPCs in the Inn will trade items in exchange for these, and they’re the easiest way of changing your Luck stat. There are a couple of catches, though; using one of these may or may not raise your luck – it could lower your luck, too. Best to save at the Roadside Inn or somewhere else before using these, if you want higher luck. Second, the Knight sells many items in exchange for these, but some of the more expensive items depend on your class, and the expensive items are… expensive. Good, but expensive. The Old Palace is a great place for accumulating these, but the Labyrinth of the Dead isn’t that bad, either. Being the first full-fledged area that you visit in Blaze & Blade, the Wood of Ruins is a pretty easy introduction to the game. 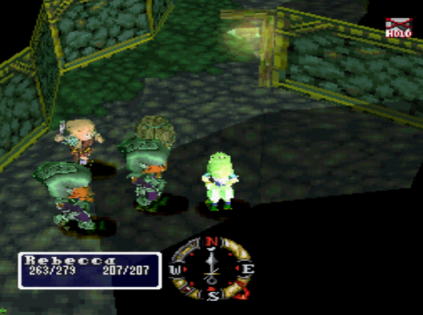 Sure, there are monsters that can cause some trouble – namely, Beetles and Goblin Mages, for being tough to attack and for being able to cause a lot of damage, respectively – but the game never gets easier, and here the enemies are reasonably easy to run around and escape. 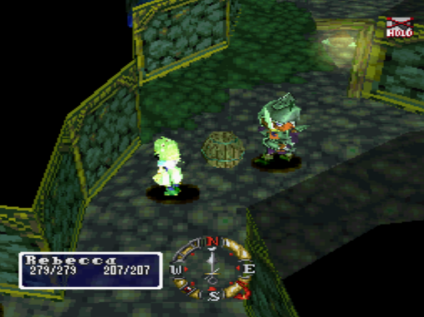 Though players can return to the Wood of Ruins at any point, the only way they can make progress after a certain point is by possessing the Sagestone and four jewels; the Boathouse Key allows adventurers to finally take a boat out to the ruins, but an important door won’t open until the Sagestone is four-ninths full. Boating is… fun. If the boat were any smaller or flying enemies more plentiful, it’d be fun in the Dwarf Fortress sense, but as it is, it’s pretty well done. The eponymous Ruins of the Wood of Ruins are in and around a lake, so, naturally, in order to reach necessary portions of the ruins, you need to use the boat. Thankfully, you get instructions as soon as you enter the area. Directly ahead of where the player starts is a pier, and the door that won’t open until the Sagestone and jewels are brought to it. Nothing can be triggered in this area until that door is opened, at the very least, so curious low-level adventurers usually stop here, if they didn’t die to the wisps and treant already. And a treant, and three wisps. The enemies in this area aren’t that bad; wisps are the only variety that fly, and they’re like griffons in that they can’t do much damage. Mercifully, they don’t have the griffons’ poke ‘o doom attack, either. Treants are tough casters that love to throw out Poison Cloud and Petrify; you don’t want to get hit by Petrify, but thankfully it’s short-range. Then there are light-blue lizardmen that last appeared in the Wood of Ruin’s swamps, and die in a single hit. More worrying are the new black lizardmen, much tougher than their younger blue siblings, dealing darkness damage with each hit. Lastly in this area there are rafflesia flower monsters that don’t do much or take much damage at all; they love to drop herbs, though. A lot of the enemies in the area are weak to wind, so Lightning Bolt is a reasonable choice for attacking. Blaze is still a good choice, too, as it doesn’t do much less damage than Lightning Bolt. Activating the ruins’ portal takes you to the Canyon, and the bane of my existence. Blaze & Blade does something very cruel here; the bridge? The short way to the other side? Attempting to cross it causes a pillar to collapse on it, without fail. You have to take the long way around. The long way around is loooooooong. The enemies are the same as in the previous area, with perhaps the omission of the weaker blue lizardmen. There’s no treasure here, that I can see; the whole area’s just walking a long way in one direction, skirting around the edge of the canyon, and then walking back the whole way on the other side. Close to the end, there’s a bunch of wisps that I love trying to kill in one Lightning Bolt, but that’s about all the fun to be had here. Past the Canyon is… the Holy Land, as an earlier sign mentioned. I assume they mean this place, rather than the Canyon; they were probably the ones who put that old bridge (…and pillar) up in the first place. It’s been years since anyone visited, though. The ‘Holy Land’ is a desert, now, with quicksand pits and monsters; Basilisks and Wyverns predominantly, but also Giants who look a little like the Savage Fighter from the inn. Wyverns are your standard flying annoyance, though they stop moving to attack you. Basilisks are lizards, though different from the lizardmen; as the name suggests, they can petrify you. Petrification is a very dangerous status alone, as it both freezes you in place until it wears off naturally, and saps your health like poison does. It doesn’t let you use spells, or items. So don’t get petrified, you’ll probably die. Giants… or Giantesses? They look female to me… well, they’re tougher than treants, and do a lot of damage with their physical attacks. There’s a glowing pool to the northeast of the savepoint-area in the desert, and I’m not sure why it’s there. Maybe it heals, as I wasn’t damaged when I got there. Or perhaps it’s just meant to look significant, like an oasis in a desert should be. It’s probably holy. Natural that I find a source of holy water and have no undead to test it on, hm? For pre-boss puzzles, the Wood of Ruins’ Holy Land/Desert is probably one of my favourites. Singing stones in the desert is a nice mental image. If I recall correctly, the final level of Fairy spells is hidden here, too. I’m using the wrong class for those, though, and the last time I played a Fairy, I went mostly-melee. Not quite sure how I managed to get this far in the game doing that, really. Okay, the boss. In a nice piece of attention-to-detail, this is the creature the Warrior, Rogue, Priestess and Sorceress were fighting in the animated intro. The boss is recogniseable only by process of elimination – I.E. it’s not Griffon, it’s not the Dark Elf, it’s not… you get the idea, but the area itself is recogniseable, down to the ‘pillars’ of falling sand from the desert above. 1. It can jump forward to pounce on you for a physical attack. This is similar to other large bosses and their ‘pushing’ attacks – like Griffon’s charge or the Owlbear running at you. Behemoth doesn’t home in on you with this attack, so it’s fairly easy to dodge so long as you aren’t meleeing. He only seems to do this if you’re within the range of one or two of these. 2. Behemoth can also jump up on the spot, and cause a minor earthquake when it lands. The range on this extends just over half a screen from Behemoth, depending on how you have the camera oriented, and you have only a small chance to get out of range from the moment Behemoth lands, before the animation kicks in and you start taking damage. Causes earth damage. The best defence against this one is just to start running when Behemoth jumps. 3. Behemoth loves casting Poison Cloud. Though it’s more powerful than the treants’ version, it’s not something to worry about if you’re fighting at range; if Behemoth is offscreen or mostly-offscreen, you’re too far away for the spell to start tracking, and it’ll just hover above Behemoth’s head. Poison Cloud is Behemoth’s largest-range attack, and it ranges about one full screen. Easy to avoid if you’re prepared and far away from Behemoth, and if it does start tracking you, there’s plenty of space available to keep running to avoid it. 4. Like certain other enemies, Behemoth can also cast Petrify. Again, this is another example of a spell that’s worse for melee characters than ranged, as Petrify is pretty short-range. Not that it’s the most problematic of spells, as it’s a thin straight line that can be sidestepped. 5. Lastly, Behemoth can toss out Earth Javelin; it’s pretty easy to tell when he’s about to cast this one, as it has a much longer casting time than the other spells. This is essentially a remote version of his earthquake attack, as the projectile the spell produces stops, eventually, and causes spikes of earth to shoot up from the ground. Possibly the nastiest of all his attacks, but I never got hit by it; just stay away from the projectile and you’ll be fine. Behemoth isn’t the most aggressive of bosses out there; it doesn’t seem to have a love for rushing into melee range, and it has no truly long-range attacks that can hit you from anywhere like some bosses possess. And, blast, it’s a choice between Abandoned Mines and THERE next. Joy. I’ll have to fight him twice, too… hmm. Choices, choices. Anyway, Behemoth is one of those bosses that’ll be hellish for anyone who needs to melee it to death; it has a lot of health, and many attacks that can really screw up a person’s day and are tough, if not impossible to avoid at short range and warning. However, playing a Sorceress or other class with magic makes it much easier; the arena is absolutely huge, at least two or three screens across in each direction, and it’s possible to just exhaust your MP with your favourite long-range spell (I recommend Lightning Bolt) with Behemoth offscreen, and then run around the edges of the arena staying safely out of sight until you can cast the spell again. It’ll take a long time without MP-restoring items, as Behemoth still has a lot of health, but as battles go, this is pretty safe. Winning nets you a jewel; in a nice touch, it’s the same jewel from the introduction, too. I thought those guys already got it, though…? Hm. Maybe there’s a vending machine, somewhere. …uh, assuming you remembered to push the statue out of the circle back at the meadow. I never do. Makes me wish I’d remembered yesterday’s Item of the Day, too, but even without any treasure chests for me in the region, I still managed to pick up more than an inventory of loot. Protect against being turned to stone. So, the Wood of Ruins is as cruel to non-Hunters as ever. Despite coming across no treasure chests in the Ruins, Canyon and Holy Land areas, I still managed to get lucky with enemy drops, including something (disappointing) from Behemoth. Basilisk Scale – handily dropped by Basilisks – either makes you immune to petrification, or just resistant. I’ve never had to use it; getting petrified earlier is the only time I’ve ever been petrified. If I had to go for a status-resistant accessory, I’d choose to prevent something more common, instead. I could have used those two Recovery Perfumes during the boss fight; they boost magic recovery when used, but I only got them from treants on my way out. Healing Perfume is the equivalent for HP, I’d assume. before increasing the Wind/Darkness element. Not really worth messing around with until you have a lot of them, or if you’re having a lot of trouble with a boss, and not that useful for magic-users. Lastly, the Earth Jewel. It could be useful to another class, I suppose, but I could just cast the spell itself. There are jewels for each element, with a corresponding spell inside, but the only one I find outside of chests following Kraken battles is always the Earth Jewel, containing That Spell I Never Use. They’re just redundant, like elemental Materials, in my case. Cheap reusable healing. Even as late in the game as the return to the Wood of Ruins, Healing Pins can still be handy despite only healing between 10 and 20 HP a use; thanks to only being consumed 25% of the time, you can get much more than that out of each. Though not good in the face of any other healing item, and really not suited for use in the middle of combat past the first few areas, they’re great to have around if you have nothing else. They’re mostly good for supplementing your natural regeneration. Since the innkeeper can always supply you with up to two, free of charge, it’s worth taking advantage of the offer. You CAN have more than two at once, as there’s at least one enemy in the game that drops them (Wood of Ruins? Old Palace? ), but it’s not common, and not worth grinding for. Opponents are attacked by lightning. A very long-range wind-element spell, though erratic; it sometimes veers to the side and refuses to hit enemies at the edge of its range. Lightning Bolt can easily hit enemies standing offscreen, as you probably learned from the Dark Elf boss fight. It pierces through enemies, and sometimes inflicts paralysis in addition to damage. Lightning Bolt is a member of the trio of third-level 16MP elemental attack spells, alongside Blaze and Blizzard. Of the three, it’s the most damaging in a single hit, but there’s no chance this spell will hit a single enemy multiple times. Even with all of the fourth-level spells unlocked, I still use spells from this group as it casts in a reasonable length of time.